If you asked me to name my idols, Cathy Mitchell would come second only to Lucille Ball. I was first introduced to Cathy as a young girl when she was advertising a product called microcrisp. Microcrisp was a weird wax/foil hybrid that you could use to brown food in your microwave. I, of course, begged my grandmother to order it for me and spent the next two months making apple turnovers in my microwave for anybody who came to visit. I think that these apple turnovers tasted awesome, but I was also 6 when I became master of the microwave and would love to hear from friends and family who had to actually choke down turnover after turnover. 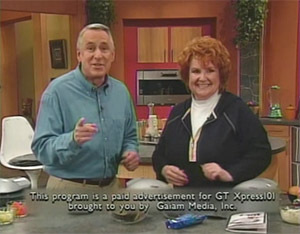 My infomercial purchases have been varied since then. I have bump-its – which do give my hair an awesome voluminous quality, a snuggie, a magic bullet, an ab rocket (oh yeah), Bendaroos (purchased as a gift), bottletops, a chia pet…probably countless others. Informercial products are like tattoos or potato chips, you can’t stop at one. So yesterday when I was watching tv and saw this: I was shocked that nobody had told me about it yet! One more thing to add to the Christmas list. On the bright side, I start working Monday. Maybe I can get a pair (or 3) for myself. This entry was posted on October 15, 2011 by letsgrabacoffee. It was filed under At Least I Think I'm Funny, Just Sayin' . Oh Brandy, I just love your blog..I can here your Mom and Dads voices as clear as day talking.